”My name is Tam Thai. I came from Vietnam. Some people run away from their country to escape a harsh life. But for me, I came here to be with my parents. I want to reunite with them. I want to challenge my life and I want to discover how Americans live. 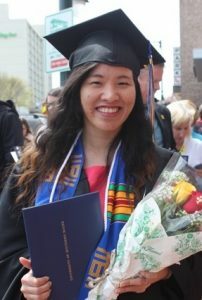 Update: In May, 2017, Tam graduated from the University of Southern Maine with a GPA of 3.48 and a degree in Computer Science. Tam was hired in August, 2017, as an application programmer in the IT department of the City of Portland.